I recently purchased a book, 50 Photo Icons: The Story Behind the Pictures. This collection of images is published by Taschen and is arranged in chronological order, covering a span of 170 years. This photograph was taken by Richard Peter and is titled "View from Dresden City Hall Tower". It does not include the date, 1945, when it was made. It does not need to. Dresden, which prior to the war had been called the "Florence on the Elbe", was fire-bombed, although it was strategically unimportant as a military target. The number of victims is still a matter of dispute today. Estimates begin at more than 30,000. The true figure will never be known because many of those who died were instantly incinerated. 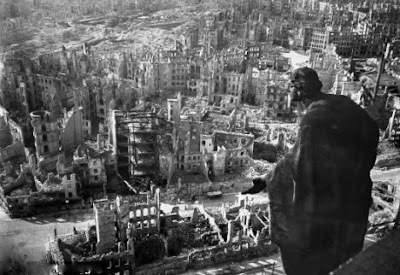 I read Slaughterhouse 5, Kurt Vonnegut's book about the destruction of Dresden, over two decades ago. Seeing this picture made me want to return to it. I had forgotten what a truly astonishing book it is. Vonnegut was able to capture the insane business of war, not only because he was there, but because he found a highly original way of relating his horrific experiences: using the device of an alter ego, Billy Pilgrim, who is a time traveller. Vonnegut survived the firestorm in Dresden only because he was a prisoner of war who'd been held in a basement slaughterhouse. It is hard to choose an excerpt from this landmark book, but I will try. Two days after the bombing, guards gathered the POWs and marched them to the place where they would begin their grisly, and monumental, task. Prisoners of war from many lands came together that morning at such and such a place in Dresden. It had been decreed that here was where the digging for bodies was to begin. So the digging began. Billy found himself paired as a digger with a Maori, who had been captured at Tobruk. The Maori was chocolate brown. He had whirlpools tattooed on his forehead and his cheeks. Billy and the Maori dug into the inert, unpromising gravel of the moon. Even 43 years after publication, this book is considered subversive and controversial. It has been banned from US schools, removed from libraries and struck off literary curriculums. In August 2011 Slaughterhouse 5 was banned at a high school in Missouri. The Kurt Vonnegut Memorial Library met this stupidity by offering 150 free copies of the novel to Republic High School students on a first come, first served basis. I hope those kids took them up on the offer.